The next version of Xiaomi's own interface, MIUI 11 will continue to have publicity. However, it will now be less cumbersome and in lesser quantity. At first, we will continue to have this symptom within your Android devices, however much one wishes otherwise, it will not be the end of this content within MIUI. Although it is sometimes tempting to mask the truth, in the words of the CEO of Xiaomi, we will have changes. At this time, most users of an Android mobile device from this manufacturer will have already realized how inconvenient this practice can be. No matter how hard you try to ignore it, sometimes it's annoying to be browsing MIUI's definitions, and getting publicity, without warning. Incidentally, not only on their smartphones, but on virtually all of their hardware. Within your products, we are sprinkled with some ads here or there. This is a practice accepted by Xiaomi as a source of income, as well as helping the brand to keep its prices low. Placement of advertising is done in order to get an extra source of income. However, it is becoming a thorn in the face of the 4th largest manufacturer of smartphones and mobile devices in the world. Especially now in 2019, with global expansion being its absolute priority. Therefore, something had to be done. Its products are already well received in Portugal, Europe and around the world. This is proven by the various market analysis agencies that give it the 4th place in the world market. However, this company founded in 2010 still has a long journey ahead until it can reach the current Top 3. It was, however, only a matter of time before the users' contestation rose. Now the complaints are felt not only in Europe, but also in India, a market dominated by it, as well as in China, its home market. Faced with this growing aversion to annoying advertising, Lei Jun has already spoken. We (Xiaomi) will absolutely remove the annoying advertisements that affect the user experience, as well as the vulgar and old / military advertisements. His testimony on the social network was collected by IT Home, which, however, also made him known. The CEO of the company took advantage of a publication to touch on some points of its next interface for Android devices. Then he was questioned by one of the users, dissatisfied with MIUI 10. 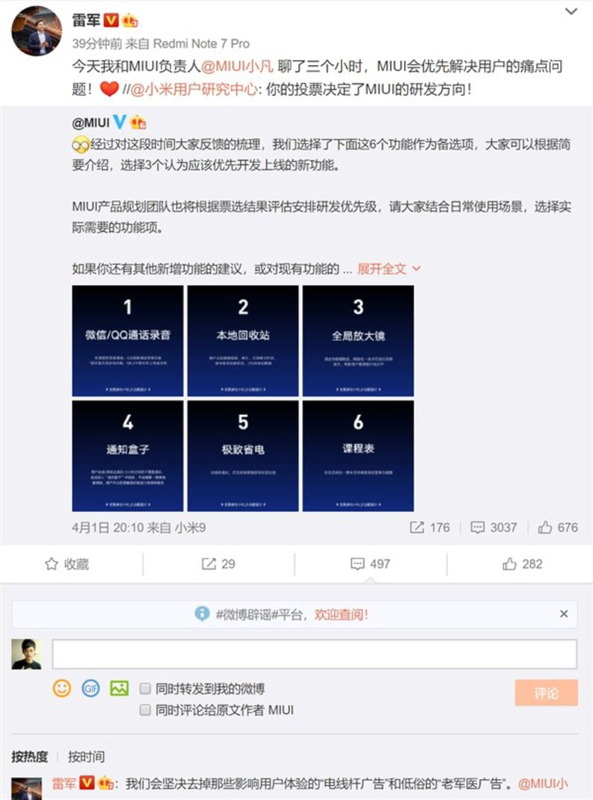 Although they are promising statements, this does not mean that MIUI 11 will be exempt from advertising or publicity. Moreover, as the press international, total removal is highly unlikely given that this is one of the main sources of revenue for the Android manufacturer. In this sense also the recent publication on the official website of MIUI. There, through social networks, the company revealed that there are other equally relevant issues that deserve the brand's attention. Therefore, you will focus your attention (also) on other points, thus providing feedback to the public. Xiaomi is a company mainly dedicated to the Mobile Internet so it would be counterproductive to give up such an important source of income. However, it is already a good sign and we will have, from the outset, a reduction in the quantity, content and format of the advertising presented. Again, according to CEO statements. Finally, if you are also waiting for the arrival of MIUI 11, you will have to wait a little longer. The interface, based on Android Pie 9.0, is expected to arrive later this summer. Until then, we will be attentive to any developments. Should Xiaomi abolish this practice, even if it meant a price increase in the products?